“Paid Search” or PPC (Pay Per Click) advertising refers to the links that appear usually to the side or above your Google (or other search engine) search results. Sometimes they are also distinguished by a heading like “Sponsored Links”. These are page links that web site owners have paid Google to show whenever a user types a certain combination of keywords into the search box. For example, in the image shown, the keywords “baseball cards” bring up a list of related sites that have paid to have their links shown against searches for those keywords. Almost immediate results. Some businesses with a new website need to see an immediate income stream. PPC is good in this respect in that you should start to see new traffic driven to your site within days. Fine tuned marketing. You can specify exactly what kind of customer you would like to promote your website to based on the keywords you pay for or even the geographic location of their IP address. Unlike other forms of advertising like print, radio and TV, with this particular marketing medium you know exactly how many pairs of eyeballs you are reaching. Google has tools available that you can access online to track how many clicks your PPC ads are getting. Its also possible to set a limit for how much you are willing to spend each month in PPC ads. Clicks are not the same as sales. Every time a visitor clicks on one of your PPC ads it will cost you money. However there is no guarantee that each visitor will complete a transaction on your site or even stay on your site very long. You need a professional website to convert visits into sales. There is not much point paying money to attract visitors to your site if it looks ugly, amateurish or is difficult to use. It can be expensive. For example if you are a trial lawyer specializing in mesotheliomatic cancer law suits (a kind of work related asbestos illness), you can expect to pay in excess of $40 every time somebody clicks one of your ads! This is an extreme case but the costs of online marketing are growing each year. What is Organic Search and SEO? 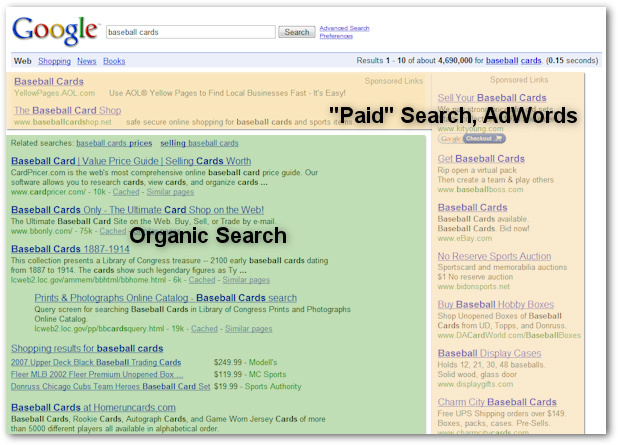 “Organic” or “natural” search results are the regular search results that Google serves up. The search engines use complex algorithms to choose sites with search results which “best” fit the keyword search the user has entered. Each search engine has a slightly different formula with slightly different weightings for certain variables which is why your search results in Yahoo or MSN are not necessarily the same as for Google. SEO (Search Engine Optmization) is the process of designing your website to rank well for natural search. Its free. At least, free in the sense that once you have done the work in creating a high quality web site, Google will do the rest for you free of cost. Users trust natural search results. A study by Enquiro and iProspect found that 60% to 70% of users chose a natural search result as “most relevant” to their query compared to the available PPC listings. In todays world of constant advertising bombardment, it’s highly probable that many online users “tune out” PPC ads when they search for something. It takes time. Getting good search engines results can be a bit like getting good weight loss results. It doesn’t usually happen overnight. Every company wants to get good natural search results so it can take a few months for your site to rise to the top of the pile. It takes effort. To consistently rank well will mean you need to spend time and energy making sure your site is always maximized for SEO success. Its usually not enough to just put up a site and forget about it. Search engines have a bias towards sites with freshly updated content. Also its a constant responsibility to manage links into and out of your site. You need to delete dead links and attract incoming links to maintain and improve your natural search result performance. The answer is that it very much depends on your financial resources and result time frame. If you have deep pockets and want quick results, a pay per click campaign is certainly worth considering. But its also important to know that once your PPC advertising budget runs dry, so will your visitors. That is why most webmasters will recommend at the very least a combination of PPC promotion PLUS investment into your website to ensure that it is search engine optimized for long term success.